My name is Dhoruba Al Mujahid Bin Wahad. Formerly Dhoruba Moore. I’m a political prisoner. I’ve been incarcerated in New York State for nearly nineteen years, which I guess makes me one of the longest held political prisoners in the world, a notoriety I do not seek, but there it is. 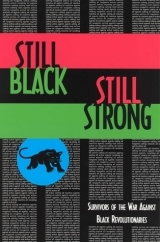 First published in 1993, Still Black, Still Strong is partly based upon the 1989 videotape Framing The Panthers by producers Chris Bratton and Annie Goldson. It recounts the stories of Dhoruba Bin Wahad, Mumia Abu-Jamal and Assata Shakur, all of whom were arrested and jailed during the COINTELPRO probe of the Black Panther Party. Dhoruba Bin Wahad, who organized chapters of the Black Panther Party in New York and along the Estern Seaboard and worked with tenants in Harlem and on drug rehabilitation in the Bronx, was accused of murdering two officers while still in his teens and imprisoned for 19 years. He always maintained his innocence and won his freedom by forcing the FBI to release thousands of classified documents proving that he had been framed. The justice department eventually rescinded Bin Wahad’s conviction and he was released in 1990, seven months after the documentary premiered. Assata Shakur was a college educated social worker in her twenties when she was accused of shooting a cop, then arrested and tortured and denied medical treatment. Her interview was conducted in Cuba where she has been exiled since her escape from a New Jersey women’s prison in 1975.